A friend of mine had asked me to create some custom Heroscape snow tiles for him, and in return he sent me a copy of Titanic Games’ “Kill Doctor Lucky” in its latest iteration, published by Paizo Publishing. I had played this many, many moons ago when it was under the control of different publisher, but the Paizo game is far better than any previous iteration, and by a good bit, too. It’s a neat little large-group game that has nice visuals and fun, brisk gameplay. 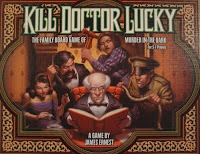 The premise of Kill Doctor Lucky is that the players act as characters who have had their good name besmirched, had their wives impregnated, had their cars repossessed, had their dogs sold into slavery, or were slipped several pounds of laxative by the not-so-good Doctor Lucky. They want revenge, in no uncertain terms, and the only way to describe their feelings toward the Doctor is in saying they would not piss in his mouth if his guts were burning with a white-hot flame. So, you see, they want to kill him, badly. For some reason, though, all these nemeses seem to be in his house at the same time, awaiting the right moment to end his feeble existence, but they can’t risk being caught, so they can only strike when nobody is watching. So, in short, this is the opposite of Clue, where instead of finding who did it, and where, with what weapon, you’re trying to find where you can, with what weapon, and how to get away with it. The box is brilliantly illustrated, and when you open it you’re greeted by an equally lovely game board, some beautifully illustrated standies that represent both the victim and the perpetrators, some tokens, and a great many nicely depicted cards. Additionally, a small but very well written rulebook accompany the good Doctor, and it will be more than sufficient to learn and play the game like a pro, even from the first play. 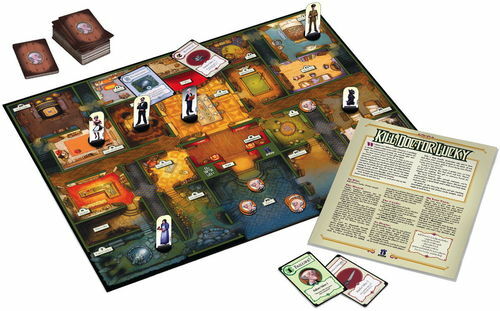 The rules contain the previously released expansions, such as “And his little dog too” which add some elements to the game to make it even more difficult to off the old man. The gameplay is fairly straightforward, as is the setup. You place all the characters that are present in the foyer area, and each turn you may move one space and either play a card or try to bust a cap into the Doc. If you elected not to play a card, you may draw a card, provided you are in a room that is named rather than in a hallway. Line of sight is of paramount importance as you may not attack the doctor if anyone can see you do it, making it all the more difficult to pursue your sinister goal. At the end of every turn, you move the Doc one space forward, sequentially, so his path is mostly predictable. Now, all of this sounds easy, right up until you realize how hard it is to kill him. He’s not called Doctor Dumbass, he’s Doctor Lucky, and he truly is lucky indeed and able to survive a multitude of attacks during a game before he meets his final disposition. You start the game with several cards in hand, and these range from allowing you to move yourself to a nonadjacent room, moving the doctor to another room, Weapon cards which are the key to killing the Doctor, and most importantly, Failure cards. Every Weapon card has an attack value, and most weapons get a bonus if you attack the doctor in the room listed on the card. You can attack him barehanded, but it only yields an attack value of one, so it’s only very rarely effective. 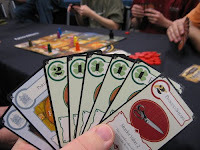 On the flipside, there are Failure cards that opponents play to stop you from killing the doctor, meaning that if you go at him with a lead pipe valued at two, you can be stopped by one player playing a Failure card valued at two or two players playing Failure cards valued at one each. The upside of failing in an assault, though, is that you are not only stopped from murdering the guy, you are so pissed off about it that you earn a Spite token, which gives you a permanent bonus of one point on every subsequent attempt at killing your target. Gameplay is very, very brisk as there’s not a whole lot to do but move, play or draw a card, and then move the Doc, but when attacks occur things can slow down for a second. There’s a surprising amount of strategy involved in playing the cards, though, because only the last player in line behind an attacking player is forced to use their Failure cards, so as any other player defending the Doc, you may play a smaller card than you otherwise might in order to force other players to expend their Failure cards to make it easier to be successful when it’s your turn to step up to bat….the Doctor in the skull. The optional expansions are a nice distraction as well, with a little Scottish Terrier standie walking the gameboard each turn as another person to see you up to nefarious deeds, and although the Spite tokens are actually optional, playing without them is simply a stupid thing to do because they add so very much to the game, as well as reducing the length of the game to the level of Risk or Civilization. Playing with five players using the original rules can be spotty, at best, because it really comes down to getting the right cards and right situation in order to perform a successful attack. Since the game ends when someone kills the Doc, and with no Spite tokens in play, the game can stretch on for hours and hours, it’s almost mandatory to use them. 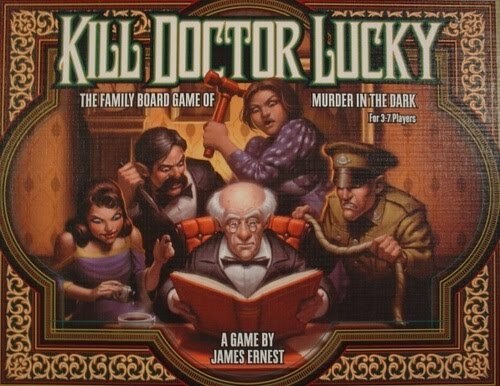 This is a great, light party game if you have a bunch of people in your game group who are not opposed to murdering the elderly. The replayability is fairly high, and this version has several variants that allow you to extend it further. Finally, the art is very nice, which makes those who appreciate eye candy more willing to spend 2 hours looking at the same game board.